FOOD=NEED is a week of performances, workshops and discussion forums around food and its use, facilitated by WIAprojects in collaboration with DPNC, Arts4All and 7a*11d. Food is a basic human need. It shapes desires and obsessions and yields many kinds of enjoyment and pain. One can explore food from diverse perspectives, seeing it both as an object produced and consumed and also as a symbol of our human relations. The diversity of what we eat (and don’t eat) and of how food is produced and shared shapes cultures, communities, and nations. At the changing of the year at Samhain, we acknowledge mortality and remember our ancestors. It is a time when the veil is thin between this world and that of the next. We trick them in costume and through play. We celebrate and honour them with tradition and story. Food is an essential part of this time. FOOD = NEED intends to animate fruitful discussion, generate creative ideas, and build solidarity among cultural producers and facilitators across communities using performance – and food. Longtime collaborators Pam Patterson and Leena Raudvee draw on the haptic, the sense of touch and presence, to investigate how women are being formed, and to reveal their attempts to negotiate this formation. “Passing” will focus on images, activities and objects which mark moments and movements from their collaborative practice. 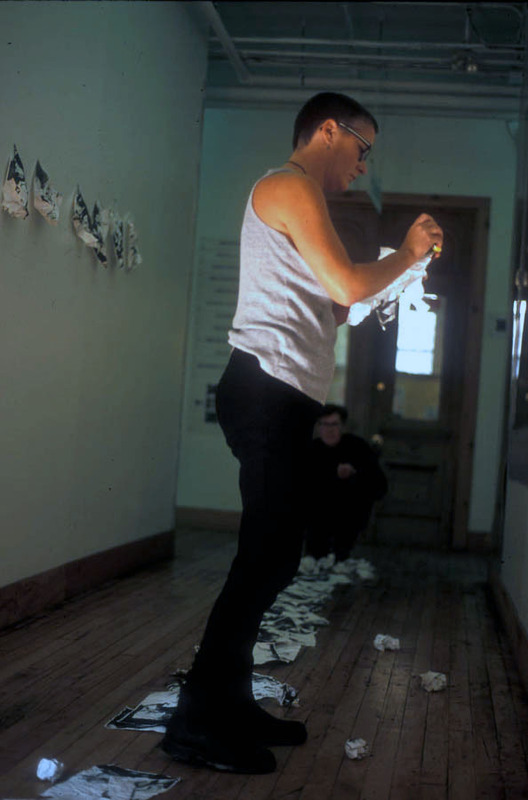 ARTIFACTS was formed in 1983 by Pam Patterson and Leena Raudvee to produce collaborative works which combine the sensibilities and concerns of art and theatre. Over the years this practice has become interdisciplinary performance art. While concentrating on performance, ARTIFACTS has also created sound and video works and visual exhibitions.